It seems life moves at a frantic pace nowadays. Time to renew the spirit or just pause and simply be is at a premium, often one of the first things sacrificed to over-scheduling and overbearing work demands. I have learned that I consciously need to make time for renewal. I need to make it a priority. I have also learned that nature is a wonderful place to reconnect, to “renew my weary spirit,” as Stevenson says. We are lucky enough to live in an area that abounds with wonderful natural places that afford unlimited opportunities to reconnect with Nature’s gifts, like the Laurel Highlands. I have a number of special places in the Laurel Highlands, ‘secret spots’ that call to me, that make a “claim upon my heart.” One of my favorites is The Ridge. Ahh, the Ridge. Actually a series of parallel ridges, worn-down rumples of rock, the first western folds of a carpet pushed into the corner by the Appalachian mountains. The Ridge itself is actually the second of the parallel ridges, properly named Laurel Ridge, just east of Chestnut Ridge. It juts only 1,500 feet above the Allegheny Plateau, but even this minor rise creates dramatic changes in the flora and fauna, as the terrain supports an ecosystem more characteristic of the boreal forest in Canada than of the hardwood plains of western Pennsylvania. Mountain laurel and rhododendrons follow the mountain streams, Canadian hemlocks and eastern white pines their traveling companions, mixing with the oaks and maples and deciduous trees more characteristic of lowland western Pennsylvania. Bears, deer, foxes, coyotes and porcupines lend to the wilderness feel, while exotic warblers and wildflowers, found only on the ridges, sprinkle their unique color. Only forty miles from my office in Greensburg, The Ridge is a fantastic wilderness, a place of escape for me, a world away from the everyday stress. So when the crush of spreadsheets and deadlines and family commitments are chasing me into my dreams, I know it’s time to visit my friend. I grab a sandwich at Mister Bones at the bottom of Cabin Hill after leaving the office. Fifteen minutes later, cruising east on Route 30 out of Greensburg, the trees start to out-number cars, and there is more green than concrete. The traffic eases, the road opens up, and rolling hills replace subdivisions. Soon it’s fence posts, fields, and farms, the big city receding far back in the distance. Traveling east past Latrobe, scenic Loyalhanna Creek roils with rapids, dividing the highway. Mountains and forest fill the windshield now, and blue sky pours through the open sunroof. My worries begin to shrink like the city in the rear view mirror. Turn off the highway just past Ligonier, cutting through regal farms and picture postcard horse pastures. Another turn and it’s all woods now, an unmaintained, pot-holed, narrow road on the ridges’ flanks. The low evening sun filters through the trees, and the road is lined with purple wild geraniums and phlox, climbing up the mountain now following a wild trout filled mountain stream. The woods become thicker. I stop at the Linn Run spring to fill up my Nalgene bottles, and drink deep of the cool, sparkling, refreshing natural water. That’s good stuff! Pitted asphalt soon becomes gravel, and gravel becomes dirt. I park at a deserted trailhead and take in a big gulp of fresh mountain air. I can breathe again, my pressed dress shirt with its starched collar and tie like a noose replaced by a t-shirt. A backpack substitutes for my briefcase, and wingtips are traded for hiking boots. Soon I am trekking deep into the woods, walking a couple of miles through the evening forest. I can feel the exertion squeezing out the stress. 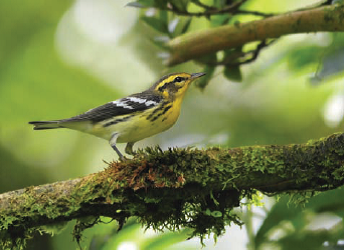 Intrusive email beeps and ringing phones are replaced by the calls of the wood warblers. Beautiful Blackburnians, with their throats ablaze in fiery orange, fill the hemlocks. Canada warblers, a string necklace of sapphire pearls set against a chest of yellow, line the trail, while magnolia warblers of brilliant blue and gold sing from the mid-story. Stately black and white warblers creep up tree trunks with a formal elegance, and the energy of the tiny orange and black American redstarts hawking insects from the under story is contagious and puts a spring in my step. A bird of the coniferous forests of the Northeast, the Blackburnian Warbler is breathtaking in its brilliant orange-and-black breeding plumage. Most numerous in mixed forests of hemlock, spruce, and various hardwoods, usually ranging high in trees. (Cornell Lab of Ornithology and Audubon Society). I enjoy the plant life, too. Ferns of every shape and hue of green unfurl, phlox of gentle lavender shoot skyward two to three feet above the forest floor, and painted trillium spring their triumvirate of three leaves between three delicate white petals ringed in pink. On the steep sections the ground is covered with a most delicate wood-land flower. Five creamy white petals veined with pink, like an unswirled peppermint candy, surrounded by three heart shaped leaves. “Hearts and candy” I dub them, so much more descriptive than the common wood sorrel name given by the guidebook. Yes, the subtle beauty of the forest flowers, nurtured in the regal air of the big trees that form a protective canopy – it fills my soul! 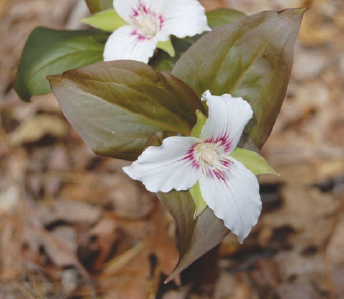 Ohio designated the white trillium (Trillium grandiflorum) as the official wildflower in 1986. Found through-out the central and eastern US, the white trillium is also called wake robin, snow trillium, great white trillium, or large white trillium. Turning off the main trail, I lose the blazes – there’s my hidden dark hemlock grove, perched above two converging streams. Refuge, home away from home, my secret spot, so close, but so many worlds away! My tent is quickly set up in the soft hemlock needles on a perfect level bench between three giant hemlocks and the backpack is hung on a snag. Hiking boots are exchanged for tevas, the camp chair is inflated, and I enjoy a sandwich and a cup of steaming hot soup, a bit of dark chocolate and a glass of wine under the hemlocks. Evening vespers is performed tonight by The Woodland Thrushes, Wood and Hermit and Veery, as the sun sets through the trees. Everything I need is within arm’s reach. I sit back tonight and do nothing. What was I so frazzled about? Worries recede. I go to bed in a flyless tent under the stars and moon when I am tired, usually fairly early without homework to check and a yard to mow. Dreams come quickly, soothed by the constant gurgle of the rushing mountain stream. Joe Walko is a full time widowed parent to two beautiful but challenging boys, now unemployed by choice after a 25-year career in Corporate Finance, a writer and blogger searching to find his voice, a seeker, a nature and adventure junkie discovering whole new worlds and beauty in the glorious struggle, in the ordinary, in my own backyard, and mostly, in my heart. By megan1903 in Feature Stories on April 25, 2014 .